This has been out for a little bit so a lot of you have probably seen it, but it is pure comedic gold. You may remember Vince from the ShamWow commercials. He’s at it again with the Slap Chop, which actually looks like a pretty useful little tool. I got a little curious about exactly who this guy is. Research time! 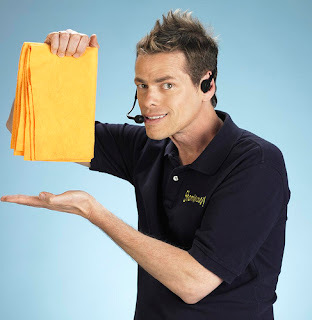 Vince’s real name is Vince Offer, which I guess is the perfect name for a pitchman. In 1999, Offer released a film called Underground Comedy Movie, which The New York Post called “the least amusing comedy ever made”. The film was built around masturbation, defecation, alienation, urination, necrophilia, voyeurism, casual brutality, and jokes about mentally retarded people. DVDs of the film were marked via television infomercial, go figure. The film starred Offer, who is credited as playing Batman, Fetus Salesman, JJ Cool, Flirty Harry, and Vincenzo Bulafungu. The cast also included Joey Buttafuoco, Slash and Michael Clarke Duncan, who is credited as “Gay Virgin”. I couldn’t make that stuff up. After the film, Offer attempted to sue the Farrelly brothers, claiming that 14 scenes from There’s Something about Mary were stolen from his own film. The case was dismissed. He also attempted to sue Anna Nicole Smith for breach of contract, alleging that Smith had agreed to appear in the film. In 2004 Offer, an ex-Scientologist, sued the Church of Scientology. He claimed that the church had declared him a criminal and urged its members to comit libel against him. Not too sure if he was successful with that one. Anyways, now that you are an expect on all thing Vince Offer, enjoy his newest work. Excellent research. I’ve been curious about Vince for quite some time now.